As I’m always telling my students, as writers we need to keep filling the creative well within us. Filling that well is different for everyone. I supposed that some people find inspiration from watching football (Go BEARS!!!! ), but I tend to find my inspiration by looking at visual artists. This isn’t to say that I don’t take inspiration from my fellow writers. However, I tend to feel that sense of wonder that I knew as a little kid when I look at things I could never think of in a million years. Lately, I’ve been finding that WOW moment from knitwear designers. I can’t get over how they manage to render interesting color, texture, and construction into their three-dimensional art. I love to knit myself, but I don’t know that I have what it takes to be a designer. Maybe that’s why I love knit designers so much, their mind quirks in a way that mine does not. 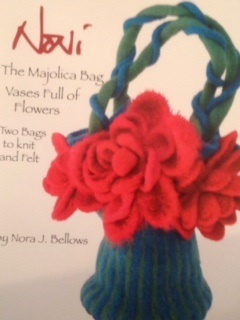 For example, I can’t get over how designer Nora J. Bellows at Noni Design can create her fabulous purses. Okay, maybe you need to be a girl to appreciate them, but the designs just jump off the page. 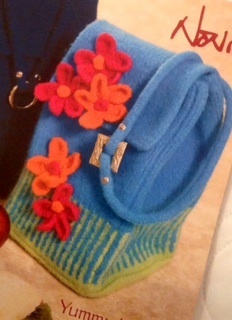 I collect Noni patterns because I get such a kick out of the vibrant use of color and the 3D effects of felting. I’ve made a bunch of them, too, and they are easy. For example, check out her lunch bag. Stripes are nice, but I love the 3-D flowers added for interest. 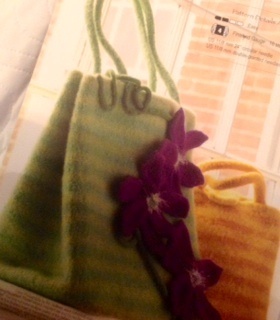 And here’s another of my faves, the clematis bag. Again, I love the stripes, but the actual clematis vine and flower literally “growing” up the bag is a touch that I would never have thought of myself. 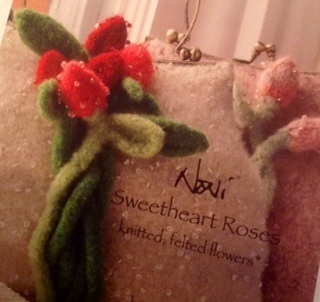 Noni Designs is also famous for flowers, as you might imagine. Here’s her sweetheart roses bag which is perfect for any special event—prom, weddings, anniversary, Nobel prize—anything. The Noni Majolica bag is an example of Noni Designs’ flight of fancy. It’s whimsical and fun. Everyone would notice you. All I need to figure out is how to instill her sense of whimsy into my writing. Pick words from random pages in the dictionary.